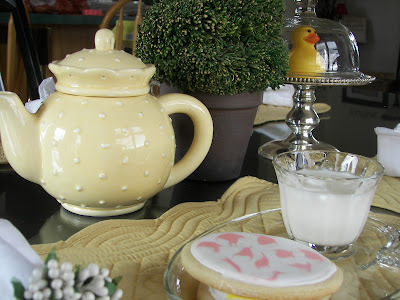 Welcome to my Easter Snack table at Red Couch Recipes. I have been so inspired by the royal icing cookies by Sue, Munchkin Munchies, and by many other bloggers! Yesterday I worked on some Easter Egg cookies which are on my table today. I have lots to learn and it was so much fun! I loved Sue's No Fail Sugar cookie recipe with the royal icing. Snack sets s are reminiscent of another era. Many wedding reception meals were served on these sets. My mother had an Asian set that I loved. One afternoon I came home from school and my eldest sister Jean served homemade cinnamon rolls of them -- such a warm, and yummy, memory. I love white napkins. They are so lovely on a table. 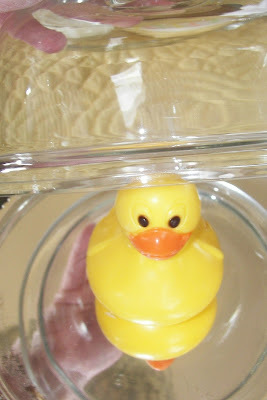 Quax appears again, en cloche, as the PEEKING (Peking) DUCK. He's cute but he really doesn't taste very good! We tried him last year. He's a rather waxy chocolate. Another shot of my Easter Snack Table. We are HUGE milk drinkers and cookies just seem to slide down better with milk. Who says tea pots are just for tea? Milk is just perfect in them too. Just a little extra tidbit. 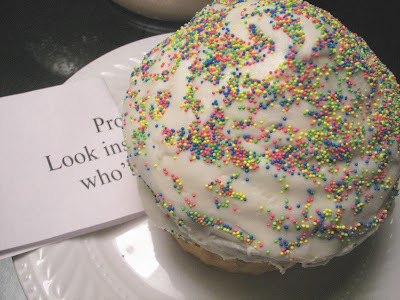 This is the super huge cupcake that my son took and door bell ditched to the girl who he is asking to Prom. Inside the cupcake he put on a piece of paper, in a Ziploc bag, who was asking. It's a vanilla cupcake with lemon curd filling and a lemon curd icing. What a cute idea, with the giant cupcake! 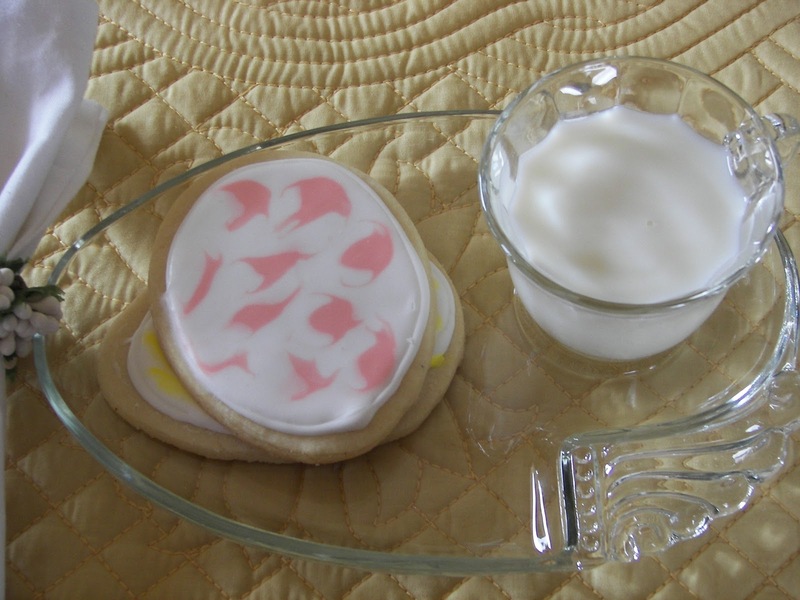 I love your Easter cookies. I'd like to try the Royal icing - so pretty. I'll have to go over for a look at the how-to. I love the giant cupcake idea! How cute! I would love to come have milk and cookies at your table. Everything looks so fun. And I love the doorbell ditch invitation to the dance. We doorbell ditch every Christmas but I never thought of it for an invitation to a prom. Trust me, we'll be using it! I love what I can see. I have a horrible sinking feeling that I am about to have picture problems yet again with this computer because I have gaps and can't see the huge cupcake. what a lovely table and yummy treats! our only milk drinker is our daughter....however my husband was making chocolate milk this morning...how do I know? 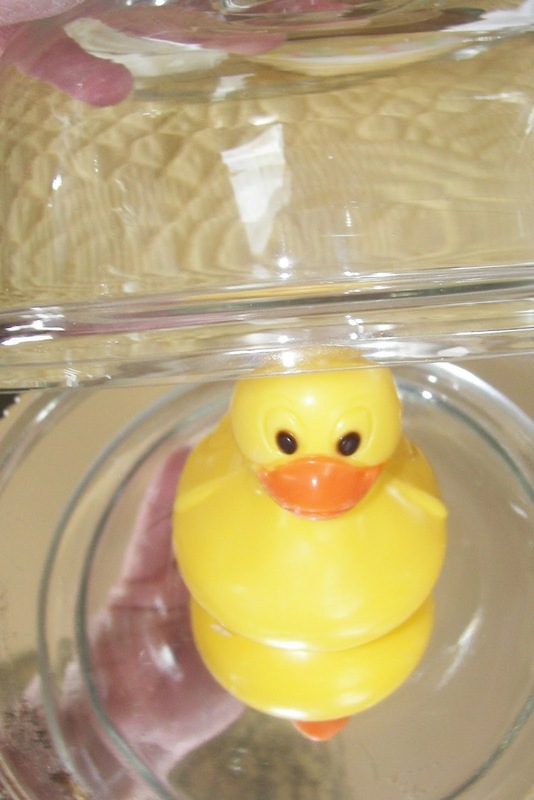 HE was clancking the glass at 5 am!!!! What an unique way to ask a girl to the prom...was her response as unique? Those cookies are making me drool! Your cookies look delicious, and very pretty! The cookies are gorgeous! Didn't you find it was really relaxing to play with the frosting? I need some nice egg shaped cookie cutters now. I love the cupcake for the Prom invitation. Chase did something really stupid. I told him everyone loves to get food. This would have been much better! I love the snack set too. I inherited one from Grandma with a price tag of $1.99 on it. I wonder if I kept it. Who has the Asian one? I kind of thought I got that too, but sure don't remember seeing it around. Have to dig through some things! 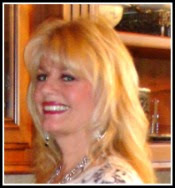 I would like to invite you to join in on a weekly recipe link on my blog. Great job on the cookies! I made them two years ago, and they were fun! I love the cupcake for the Prom invitation. The snack set too, with fond memories, is great. Great job on the cookies! Did she say yes?? Adorable idea, Joni! You did an outstanding job on those precious cookies, and I love the idea of the prom cupcake, too. Just so clever! P.S. I remember snack sets. 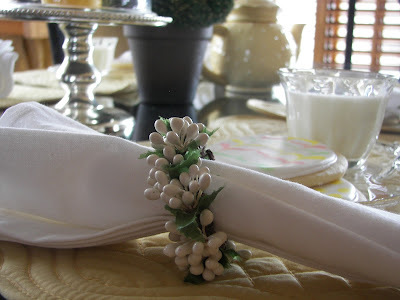 I think they are perfect for a fun snack like that and for afternoon receptions, etc. I love your snack set! Just perfect for your pretty Easter cookies and milk! The cupcake prom invitation is a darling idea -- so creative AND tasty! I am cookie decorating challenged myself! I will have to look at the links because I need big-time help. Your cookies are beautiful! I hope the girl said 'Yes' to your son! How sweet (no pun intended)! First off, a great way to ask for a date! Who could refuse such sweetness!! Love your snack set, it's very different than those i've seen. 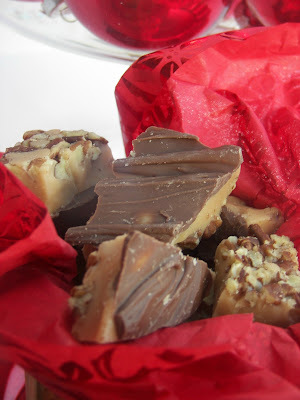 they are perfect for all kinds of goodies. 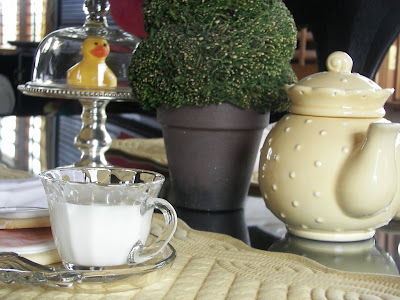 Your tea pot is soo cool. cookies look great too. Love your Easter snack tablescape! It feels very friendly and welcoming. I too have several of the glass snack sets that I have collected from thrift stores! I love them! They are what I remember my grandmother and mother serving dessert on. Your sons gusture of sending a cupcake message to a special girl is very sweet! He must have a mother who has taught him well! What a cute idea for asking a girl to prom! I love it, and I love the fact that there are still some kids out there who want to do things like that! 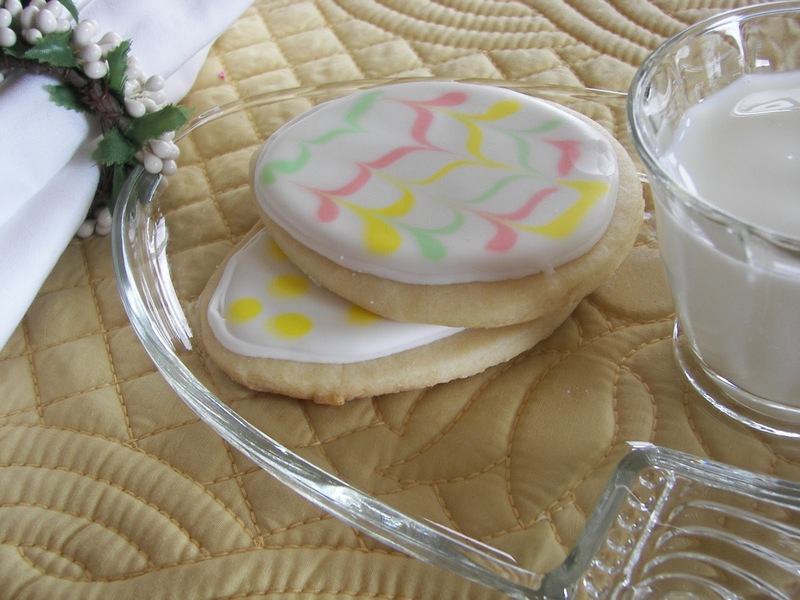 Love your Easter egg cookies, too! They're beautiful! 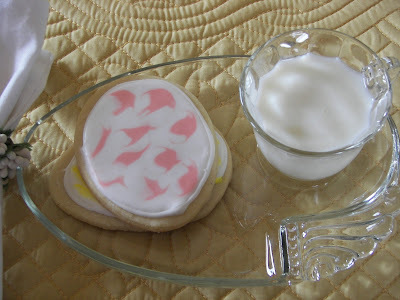 I loved reading your post and will have to try my hand at making the sugar cookies with the royal icing. That is something I have wanted to try for years and did not have the nerve to try. Thanks for the inspiration. Your cookies look beautiful and delicious. Love that prom invite. Very clever. Love those sweet easter egg cookies, Joni! I collect cookie cutters, and love to make cut out cookies. I think I will frost them like you have done. So cute!! Thanks for the inspiration. Who could say no to a cupcake invitation to prom? NOT ME! Your cookies are so cute. I'll bet they were delicious.